In Lebanon and other countries that ring the Eastern Mediterranean, labneh is a mainstay of the breakfast table. It is a yogurt which has been strained in a muslin cloth, for about 24 hours. It is commonly made using cow’s milk which is available all year; it is also made from goats’ milk from April to September. In households throughout Lebanon, labneh is consumed on a daily basis. Labneh has a cheese-like consistency and is usually eaten at breakfast, or as a filling for pita sandwiches and also appears at lunch and dinner. One of my favorite breakfasts is to toast some flatbread, slather on labneh, drizzle with extra-virgin olive oil, and sprinkle with dried mint or za'atar, a seasoning blend. Sliced tomatoes, cucumbers, black olives and fresh mint leaves are its usual companions, even at breakfast. A plate of labneh is always found in the traditional mezze, either plain or garlic-flavored*. 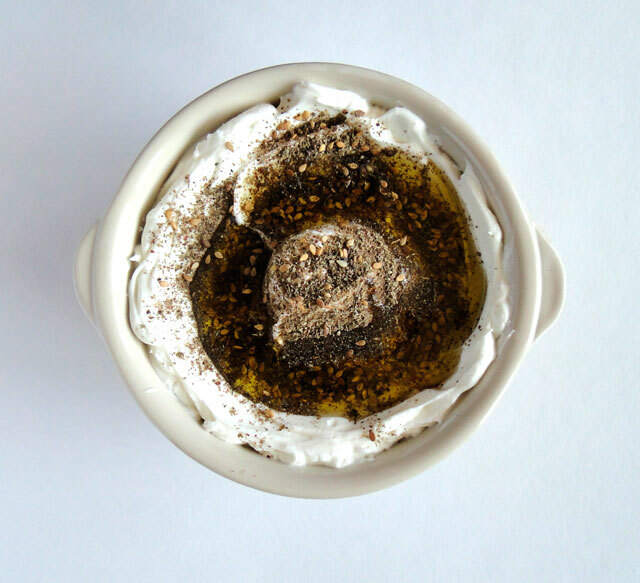 Here, I made the classical labneh using cow’s milk, and I sprinkled it with za'atar and olive oil! It’s the easiest homemade dip you will ever make. In a medium bowl combine yogurt and salt. Line a colander with a double layer of cheese cloth. Place colander inside a large bowl to collect whey. Tip the yogurt and salt mixture into the lined colander. Tie the corners to make a pouch. Cover colander/bowl with plastic wrap and refrigerate. Allow yogurt to drain in the refrigerator 24 hours. 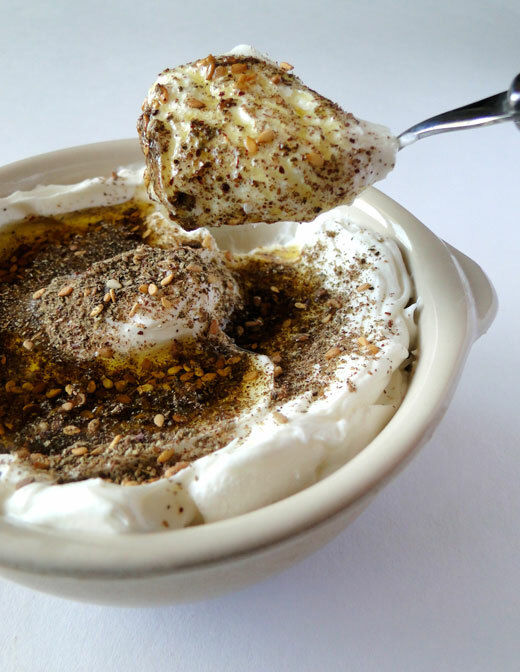 Serve as is, if you want the plain labneh, or stir in the za'atar seasoning. Drizzle some olive oil. Serve with crudites, or pita bread, or pita chips. 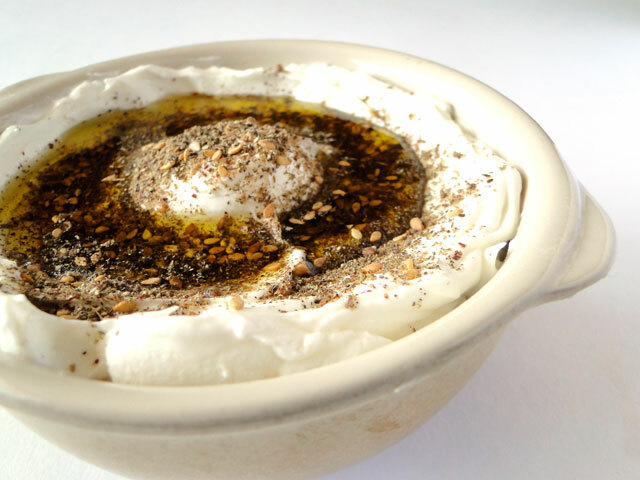 * If you like garlic, pound 1 clove of garlic and mix it to the plain labneh to obtain labneh-with-garlic. Dans un bol moyen, mélanger le yaourt et le sel. Tapisser une passoire avec un torchon propre. Placer la passoire dans un grand saladier. Verser le yaourt dans le torchon. Rabattre les pans du torchon par dessus le yaourt et laisser égoutter dans le frigo 24 heures. Servir tel quel, voire nature, ou bien ajouter le za'atar. Verser un peu d'huile d'olive. Servir avec des crudités, du pain pita, ou des chips. * Si vous aimez l'ail, écrasez une gousse d'ail et mélanger-la au labneh nature, ainsi vous obtiendrez du labneh à l'ail. I am big on dips! Love this new dish that you have introduced me to. Looks great and I net it tastes great as well. Can this be consumed sweet?Curious! j'adore tout ce qui est libanais et tu me gattes avec toutes tes recettes! I've never had this - it looks amazing! That looks wonderful! Beautiful photos! Chico, I cannot see myself having this for breakfast but I would surely offer it as a meze....great for scooping up with pita bread! I am drooling over this! With the summer heat approaching this is going to divine. Wow, what beautiful pictures. I think the Mediterranean breakfast is amazing, It's delicious and healthy. This with some cucumber and carrot sticks would be great at happy hour too. Give me some pita bread and I am set. Looks terrific! J'adore le labneh et j'en mange tous les jours! et je suis folle du zaatar, comme toi! This sounds excellent! Perfect with garlic pita chips I've been snacking on :) Your pictures are gorgeous! This sounds delicious! I've not had this before but it looks so good, and your photos are wonderful. I am such a great lover of za'atar and anything middle eastern, but i have never tried this yet. I think I just have some greek yogurt in the fridge screaming to be used for this. Thank you. What an incredible dip! Not sure if I could eat it for breakfast, but I could serve it with some awesome pita bread. I sooo love lebneh. I usually make it with dried mint instead of za'atar. Yours looks beautiful!!! Je le vois servi bien avec des crudités et un petit verre de rosé ce soir en terrasse. That looks thick, creamy and delicious. I would love it as dips for garlic bread. That is soooo delicious! 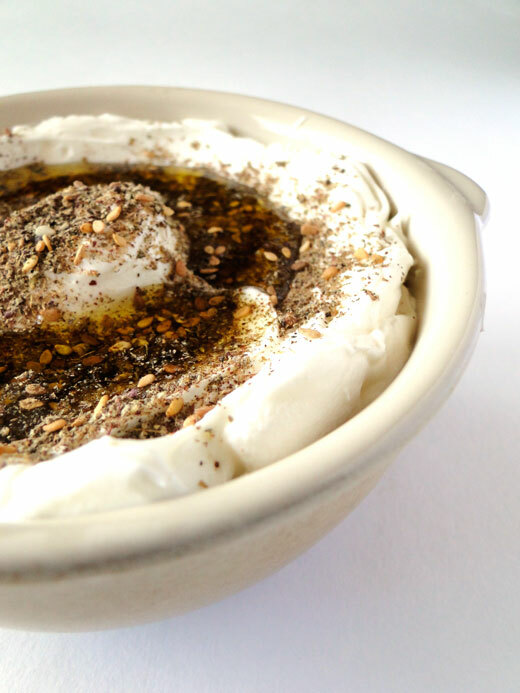 I lov labneh and za'atar! Perfect for the warmer days! Great consistency on the labneh. It looks just perfect. Where do you get your zaatar in Paris? I have a stash that people bring to me from Lebanon. Handpicked, wild zaatar, far superior to the ones you get in Middle Eastern stores in Sydney. I also bring my zaatar with me from Lebanon, it's also hand picked, here you cannot really find high quality zaatar!! Superb. I would never have imagine yoghurt as a spread/filling, except on pancakes but drained, spiced and it would shine like a star! I usually make my own yogurt these days (cow's milk) and I will definitely give this a try. Oh wow! This looks like pure indulgence! I'd have this with everything if I could! I too am admiring the creamy consistency of this dip ... it looks mouthwateringly good! I love the idea of this savory breakfast, it looks so wonderful! Cherine goodness this looks beautiful!!! You know when I made my hummus a reader told me I should've added za'atar and I had no idea what that was. But now i know it's a delicious blend of spices, you think I could find it in my Mediterranean market? Hello Joy, thank you for the comment! In fact zaa'tar is a delicious blend of dried thyme, sumac and sesame seeds. You definitely should find it in any Mediterranean market! Cherine, that looks totally sensational! I came across your blog from other blog and I am happy to find your blog! Last year, I went to a lebanese restaurant for the first time and I absolutely loved it. Since you are lebanese, I hope I can find many great lebanese cuisines in your blog. It sounds delicious! Your photographs are amazing! YUMM! I am having this for breakfast. This appears on my table at least 2-3 times a week. I love it. and this is something that you will always find in my fridge. Only I love to add some creative fantasy every time. Some dried tomato pieces, or minced spicy fresh red pepper, or whatever pops up in my mind. It's always delicious and I never buy spread cheese anymore. Can I lather the labneh onto Pita Bread. Pour a bit of olive oil and salt. And then put the whole thing in the oven till the Pita bread hardens a bit and the labneh becomes warm and creamy? Can I do that?